A range of signal analysis equipment and devices for vibration testing and machine monitoring is being offered by AcSoft for use in aerospace, automotive and defence industries. AcSoft is now offering Crystal Instruments’ wide range of signal analysers, vibration test controllers and machine monitoring devices and software for the UK automotive, aerospace, military and electronics industries. California-based Crystal Instruments is a manufacturer of systems and software for machine monitoring, dynamic measurement and vibration and acoustic testing. The company’s products are widely used for machine diagnosis, design verification, product testing and process improvement by manufacturers of all types of electronic and mechanical products. The company’s vibration controllers, high channel count dynamic measurement systems and wireless analysis are suitable for a variety of applications in the Aerospace and Automotive industries, for example. These include vibration testing, data recording for dynamic signals, acoustic measurement and frequency response function. In the Automotive market, products from Crystal Instruments are an invaluable tool for NVH Engineers who use them as part of in-vehicle data recording and analysis, dynamometer testing and chassis tuning, drive-line balance and stability tests, pass-by acoustic monitoring, component shake and durability testing and transport simulation with time waveform replication. For Aerospace, the products are aimed at ground vibration tests, wind tunnel dynamic studies, flight stress and vibration recording, engine durability testing, launch and separation simulation and Sine, RSTD, Random and SoR. Amongst the Crystal Instruments’ products being offered by AcSoft is the latest Spider series of dynamic signal analysers. The Spider-20, which measures just 125mm x 100mm and weights 510 grammes, is the most compact instrument in the product line and caters to the market demand for smaller and more powerful units. The four input channel Spider-20, with one output and one tachometer channel, boasts built-in wireless connectivity, six hours of battery power and iPad compatibility with Crystal’s EDM app for iOS, which is included in each sale. The full dynamic signal analysis function of EDM, the PC Windows version, is available for purchase. The hand-held Spider-20 is self-contained so it can function independently of a PC and the battery is interchangeable to accommodate limitless hours of field work. Like other instruments in the Spider series, the Spider-20 has applications in the fields of machinery diagnosis, acoustic studies, vehicle dynamics, remote monitoring, dynamic signal analysis and many more. 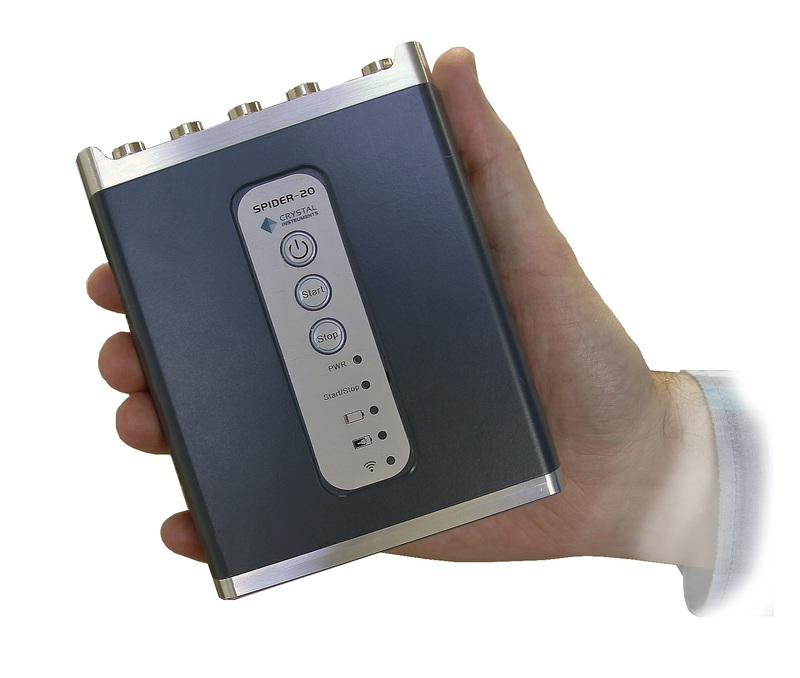 The Spider-20 can continuously record time waveforms on all four input channels and record this data to its internal 4GB flash memory.